Shafeah M'Balia is a North Carolina activist. In March 1998 “Endorsers of the Call” to found a Black Radical Congress included Shafeah M'Balia, Black Workers for Justice; Health Care Activist. Endorsers for the Congress included Shafeah M'Balia Black Workers for Justice. M'Balia attended the 6th National Convention of the Committees of Correspondence for Democracy and Socialism (CCDS) at San Francisco's Whitcomb Hotel July 23-26 2009. As at Jan. 14, 2009, M'Balia was a member of Black Workers for Justice. 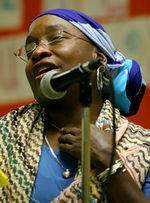 On Saturday, November 14, 2009, Shafeah M'Balia spoke alongside Sharon Black, Ellen Catalinotto, Phebe Eckfeldt, Martha Grevatt, Sandra Hines and John Parker on the second panel at the 2009 National Conference of Workers World Party. Gloria Verdieu chaired the panel. On September 21, 2010, Shafeah M'Balia attended a meeting at a midtown hotel with President of Iran, Mahmoud Ahmadinejad, and approximately 130 members of the U.S. "peace and social justice movements", as well as "major figures in the Black activist community." M'Balia was also among those who made opening remarks at the meeting. Ashaki Binta/NC, William Darity /NC, Ajamu Dillahunt /NC, Joyce Johnson /NC, Nelson Johnson /NC, Joseph Jordan, Julianne Malveaux / NC, Shafeah M'Balia, Naeema Muhammad /NC, Saladin Muhammad /NC, Mark Anthony Neal /NC, Ed Whitfield /NC, Leah Wise / NC. The annual Black Workers for Justice event commemorating the death of Dr. King and highlighting his support for workers was held Saturday, April 11 2015 at the NCAE Building located at 700 Salisbury Street. The guest speaker will be Alicia Garza, co-founder of the Black Lives Matter Movement. The theme, “Reclaim Dr. King’s Legacy of Resistance: Black Lives Matter/Stop the War on Black America” was selected because it captures the horrible reality we are facing and suggests a way forward. The murders just keep on coming. The world is watching the video of a white police officer in North Charleston, South Carolina gun down a fleeing Walter Scott, a 50 year old 2015 banquet flyer.colorAfrican American man. He was stopped for a minor traffic infraction. Self-Determination Awards were given to Elandria Williams (cooperative economic development), Robert Dawkins( police accountability), Milton Pitt & Shafeah M'Balia (worker/member) and Mari Caldwell & Ajamu Dillahunt-Holloway (youth activist). Muslims for Social Justice was founded in North Carolina in 2013 to offer a liberation theology perspective in Islam. Key founding members included Saladin Muhammad (Black Workers for Justice), Shafeah M'Balia (Black Workers for Justice) and Manzoor Cheema (human rights activists). Muslims for Social Justice supporters February 28, 2015, Manzoor Cheema, Sameer Abdel-Khalek, Ahmad Jitan, Mousa Shehadeh, Faisal R. Khan, Shafeah M'Balia, Sijal Nasralla, Fatimeh Alsayed and Saladin Muhammad. This page was last modified on 12 September 2017, at 00:26.